James Harden left the game in the first quarter with a bruised right knee before Houston beat Memphis 92-73 on Friday night in the final preseason game for both teams. 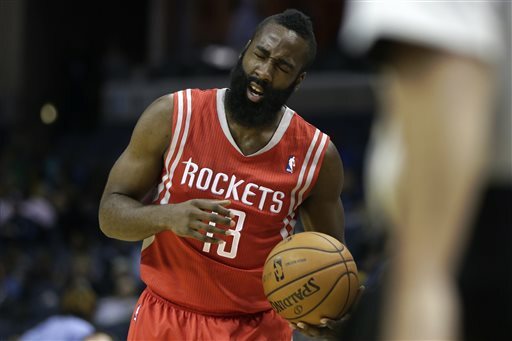 Harden exited after he was fouled on a 3-pointer. He didn’t return. Omri Casspi scored 11 points, Donatas Motiejunas finished with 10 for Houston. Marc Gasol led Memphis with 17 points, but connected on only 4 of 13 shots. Both teams played mostly reserves after halftime as the Rockets lead reached 27. The game was a bit chippy at times with Gasol and the Rockets Dwight Howard earning double technicals in the first half, and Memphis forward Ed Davis drawing an ejection with a flagrant foul in the fourth.